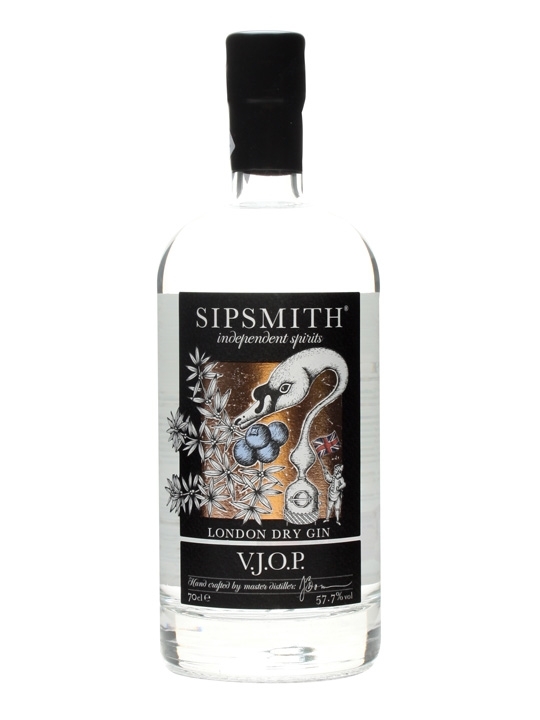 While at my favorite watering hole recently, I noticed that they had a ‘new’ Gin on the shelf: Sipsmith VJOP. I thought I would have a go and I’m very glad I did. This Gin is excellent! So what does VJOP mean? Well, I’ll break it down starting with “VJ” or Very Junipery! Emphasis on VERY. There are other flavors that surround and compliment the Juniper, but there’s no mistaking what the headliner is here. 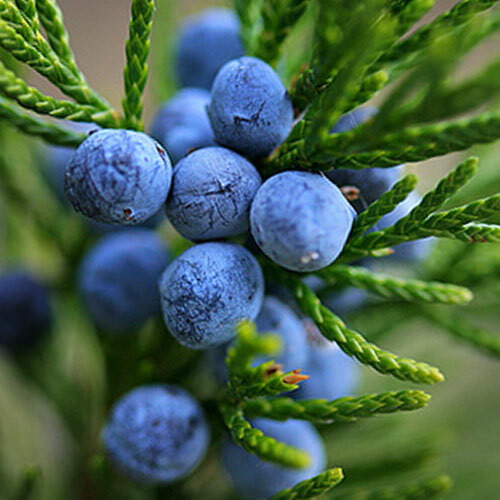 With so many craft Gins popping up these days it seems that often the Juniper gets lost as Gin distillers rush to add more exotic and unusual flavors to their Gins. I can just picture the distiller looking over his/her most recent creation, checking off the ingredients . “Yes, there’s the pomegranate, the cinnamon, the radish, the bat’s wing, the newt’s eye, …. what is missing? OH! Right this is supposed to be gin!” Then he/she gets one juniper berry and throws it in the 100 gallon vat. Not this VJOP! I believe that on the receiving dock at Sipsmith you’ll find someone dragging in a whole Juniper tree; berry, bark, stem, and pins. They just throw it in the vat and then toss a couple of other flavors in to smooth out the Juniper. So if you’re like me and enjoy that pine forest scent and flavor of Juniper, this is a Gin you have to try. Personally I had it as a very dry Martini but I really think it will be great as a G&T with the Juniper complimenting the tonic. I’ll be trying that soon. Oh, the OP? Over Proof! As in 57.7 ABV! A couple of VJOP Martinis and you’d better have a designated driver available. Or Uber it. This is one potent Gin. The history of the martini is a murky one. As one might guess with many alcoholic concoctions through time, things weren’t always written down. This appears to be the case with the Martini. There are also a few historical references points from which we can at least set some boundaries. Gin itself goes back to the 17th Century Holland, though ‘modern’ Gin started a bit later. Gordon’s produced its first version of London Dry Gin in 1769 and Beefeater came along in 1862. An Italian vermouth maker, Martini & Rossi, started marketing its product under the brand name Martini in 1863. Still the exact location and date of the invention of the “Martini” is a bit confusing. There appear to be 3 1/2 main conflicting story lines. The first, and the half, is that the Martini originated in California. The second that it originated in New York. And finally that it was a marketing ploy. The town of Martinez, CA, advertises itself as the birthplace of the Martini so we’ll start there. It suggests that the drink in fact originated in a prominent bar in Martinez, where it was known as a “Martinez Special.” There it was served to a celebrating gold miner on his way to San Francisco, who, after enjoying the drink so much, delivered the recipe to San Francisco when he had to instruct a local bartender on how to make it. That bartender is allegedly the “Professor” Jerry Thomas. During the late 19th century Thomas was renowned around the US for his innovative bar-tending work, flashy techniques, and man-about-town demeanor. He claims to have invented the cocktail himself while at the Occidental Hotel in San Francisco. He contended that it was for a gold minor on his way across the bay to Martinez and beyond to the California gold fields. Thomas therefore named it in honor of this traveler. Whichever of these may be true, or not, none-the-less Thomas is noteworthy for publishing the first seminal cocktail manual, The Bar-Tenders Guide. The aforementioned 1887 edition included the Martinez cocktail. The recipe was: a dash of bitters, two dashes of maraschino (a cherry liquor), a wineglass of vermouth (most likely sweet vermouth), a pony of Old Tom gin (a sweetened gin) and a quarter slice of lemon! However that is nowhere near today’s gin and vermouth definition of a Martini. So does that count as the invention of THE Martini? Or just a predecessor? Another interesting note about the California stories is the reference to the gold miner. The California gold rush started in 1848 with the first ‘rush’ of incoming minors in 1849. Hence the name ’49ers’ for the San Francisco American Football team. The Gold Rush peaked in the early 1850s and was pretty much done by the late 1850s. If these stories are to be believed that puts the date of invention firmly in the 1850-55 range. Another theory promoted by some cocktail historians is that the Martini first appeared at the New York City’s Knickerbocker Hotel. This hotel was, in the early 20th century, manned by bartender Martini di Arma di Taggia. He claimed to invent the drink before World War I. The story goes, he served a drink, a favorite of John D. Rockefeller, that blended London dry gin, Noilly Prat Vermouth, and orange bitters. This is certainly a more Martini-like concoction and its likely, though impossible to verify, that he named it after himself. Its also very possible that di Arma di Taggia knew of the Martinez of California, perhaps from some returning Gold Miner? Or even had acquired a copy of Thomas’ Bartender manual. So its quite possible that both the West Coast and East Coast theories are, in fact, part of the natural evolution of the Martini. Finally, some believe that the martini was named after the Martini and Rossi vermouth. This seems to be an obvious source – customers ordering a gin and vermouth concoction at a bar would simply ask for a “gin and Martini.” Given how simply drinks were labelled in the 19th centuries, it’s plausible that this got shortened over time to ‘Martini’. Martini & Rossi, as part of their branding or marketing, would certainly have encouraged this transition. This would be true even if the company didn’t invent the “Gin & Martini”. Ultimately no one will know for certain who, when, or where the Martini came to be. Personally I adhere to the gradual evolution idea. Somewhere in California a Martinez was created. Over time the drink evolved to the Martini, likely with a New York push which added a modern ‘cosmopolitan’ flair and aura. And mostly certainly encouraged by Martini and Rossi. Great Gin Selection at the local Reststop! Last week while traveling in Scotland, we stopped at a little roadside restaurant, “Stonehouse” for lunch outside of Foulis on the A9. Beside the restaurant was their giftshop. 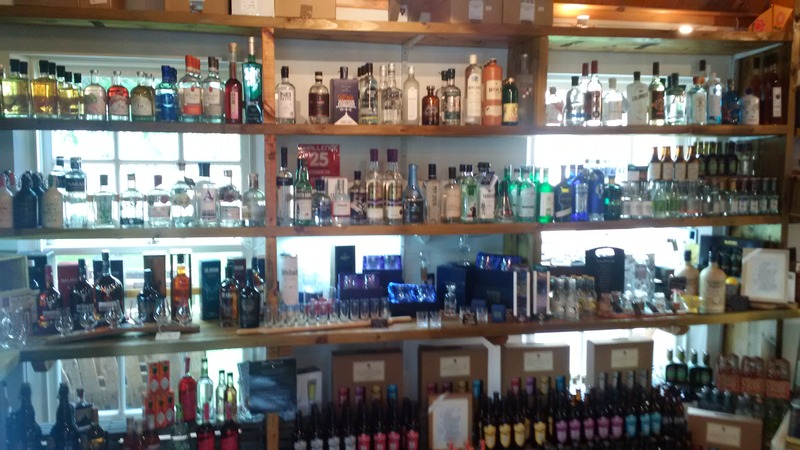 There covering two entire top shelves was this selection of Gins. Apparently I’m an elitist drinker? I’m not sure what makes me an elitist though. Is it the look I get when I order a ‘Bombay Sapphire’ Martini and the bartender looks at me with big vacant eyes and you can hear their mind sort of going “Whaaaaa?” Then they sort of look at that bottle of ‘Martini & Rossi’ Vermouth gathering dust and you can see them wondering if that’s what I want. And this wasn’t just the bartender. This was the waitress, bartender, and manager! Or is it that in my mind I’m thinking that they’re a moron? Considering that Scotland produces 70% of the Gin produced in the UK, you would think that a Martini would be universally recognized. Or does everyone order G&T? Seriously though, if you’re a bartender at a local bar serving beer to locals 98% of the time whose never seen a movie, read a book, or finished High School, I can understand perhaps not knowing what a Martini is. But other than that, you absolutely should at least know that a Martini is a drink unto itself. Or am I really a Martini elitist? If so are we a dying breed? While walking around Glasgow recently, I came across “The Good Spirits Co.” and decided to stop in. While I was intending to explore their Whiskey selection the discussion quickly turned to gins. Much to my surprise our host, Victoria, offered us a few samples of locally produced ‘new’ Gins. This was certainly something new to me! I’ve never had this happen in the US. Another fine attraction of Glasgow! There were a couple of samples that were unimpressive. One was a Barrel aged Gin which had a very distinctive taste and might appeal to some. I made previous comments about Barrel Aging in “Craft Gin“. One of the nicer Gins I tried was Jensen Gin, very much a “London Dry” style Gin. This would likely work very well in a Martini and I will look out for that in a lounge or bar to validate that guess. But the finest was Makar Gin. I’m not really sure how to describe it other then delicious. It uses only 7 botanicals, in addition to Juniper, but they meld together wonderfully. A combination of earthy, floral, and citrus flavors combine in a bright clean Gin. I sampled it neat, of course, but I think it would be excellent in a Martini. I hope to try that very soon. Unfortunately I was unable to purchase a bottle there as The Good Spirits Co. had just sold out their entire stock that morning. Which is a fine comment on the quality of the Gin. Craft Gin, the new trend?!? It seems that these days there are boutique and small gin distilleries popping up all over. Being a long term gin drinker I can recall the days when my choices at any typical bar were severely limited; Beefeater, Tanqueray, Bombay, and Gordon’s. If I was lucky a bar might have Hendrick’s. I generally applaud this renewed interest in Gin. It gives me a lot of new flavors, tastes, and aromas to experience. But it did get me thinking, there are a lot of new ‘twists’ on Gins these days and I’m not sure I like where some of them are going. Barrel Aging! Gin aged in Whiskey barrels? Cognac Barrels? Really? Either of these treatments will certainly add color and different flavors to the Gin. And, most likely, add a certain astringent taste to the Gin – what wine enthusiasts refer to as tannins. The lack of clarity of these barrel age gins certainly would not appeal to a traditionalist. And the tanninic taste I think will not go well with the fundamental juniper flavor required in all Gins. But the other flavors that come from barrel aging may, or may not, indeed offer some surprises and pleasures. I haven’t tried these yet, but I’m dubious. I’ll withhold judgement, for now. But Craft Gin? Did gin becoming a trend? Or, god forbid, a FAD? I sure hope not, I’m about as anti-fad as they come. I’d be really annoyed that some snot nosed runt of a frat boy thinks I just jumped on the Gin bandwagon last week. When I’ve been drinking gin since …. well, you know. There used to be a certain sophistication and ‘bon vivant’ feeling to ordering a ‘real’ Martini in a crowd of Vodkaphiles. I’m going to miss that.